I’ve covered in previous news commentary that some people have gotten some hints from the FDA on its intentions to regulate e-cigarettes ASAP. Essentially the agency is good to go but is waiting on approval from the OMB to greenlight the move. It turns out that seems to be true. A hat tip to Dimitris from the Vape Team for posting this up on his Facebook page. 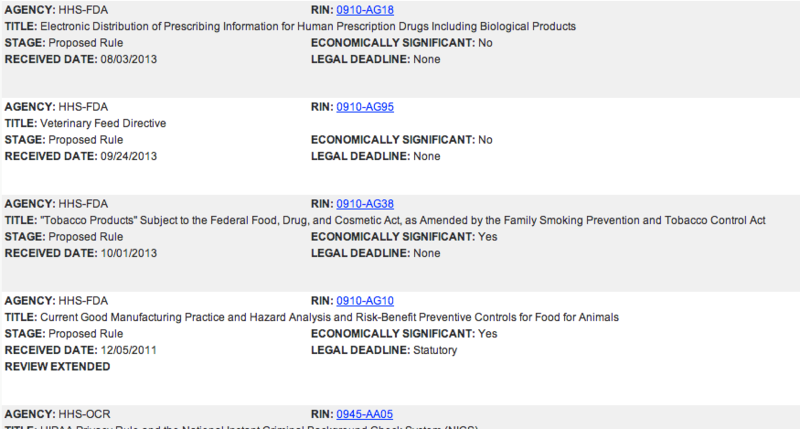 Apparently, the FDA has submitted whatever plans it has up its sleeve for approval back on October 1st. That link and screenshot up there go to the OMB’s regulatory affairs site where agencies submit regulations for approval. If you scroll down far enough in the list you’ll find 0910-AG38 right there. The link in the list goes to essentially a blank page where, presumably the actual proposed regulations will show up once the White House gives the OK (and they will). What we don’t know for sure is exactly what to expect, but it seems like the FDA has indeed stopped kicking the can down the road. No telling if they’ll make it in by October 31st as the Government shutdown is having a ripple effect on getting the massive federal machine moving again and working through its backlog. Winter is coming after all it seems. PREVIOUS POST Previous post: Are e-Cigarettes More Effective Than the Patch? NEXT POST Next post: Kanger’s Protank II Review – 2nd Chance!